The Seville Apartment building was built as an integral part of the Hyde Park community for those such as single families living in the area. Two apartments are located on each floor with windows on four elevations, permitting cross ventilation similar to that found in a detached home. The interior lobby in the Seville replaced the front porch as an interior space for neighbors to interact with one another and welcome guests. Similar to single family homes in Hyde Park, a rear entrance was provided for deliveries and service. 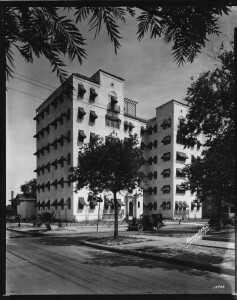 The Seville became the first residential condominium building in Tampa. The floor plans of the apartments located in the Seville Floor were similar to the bungalows found in the surrounding Hyde Park neighborhood. Each unit has a separate front and back door with separate elevator service.